Are Network Marketing and Affiliate Marketing Crossing Paths or is a New Evolution of Commission Based Selling Taking Place Before Our Very Eyes? I’ve been a shameless Internet affiliate marketer for about 12 years now. About 1/3 of my income is directly related to about 10 or so of those affiliate programs. I use the word shameless because I know a lot of people out there are against any “sales” of any kind. And, if someone is to get a “commission” for their sales efforts, then woohaa! Look out! As if sales is such a bad thing. I LOVE finding things of great value that make our lives better and then “recommending” them to others. To me that’s not really selling. It’s more of a sharing than anything. Here’s how it works. Typically, a client will ask me a question and if I don’t offer the service or have an affiliate product to offer them, I’ll go find one, evaluate it and recommend it to them. Of course, when I recommend an affiliate product, I get a commission for the sale. One of the first questions I was asked by a client that got me to seek affiliate products, to use as an example, was “Where do you recommend I register a domain name?” Gosh, that was back in…like…1999 or something. So, I went out researching every domain registrar I could find and found one that had everything I expected as well as an affiliate program. You can read more about that on this post about what you should look for in a domain name registration system. And, you can also read a post about the same system I use which I believe is still the best domain name affiliate program around. I use that example because affiliate marketing is nothing new. I sure don’t want to be a domain name registrar company and have to buy whatever servers they do and manage all those legal aspects of the business, so I found a company that offers that service and recommend it to others. I have literally hundreds of referrers with domain names registered in that system. And, every time they renew year after year, I get a little commission added to the bank. Simple concept. Today I promote 32 affiliate products on more than 50 of my own websites. I used to say “over 100″ but since Amazon doesn’t pay commissions for referred products to Colorado associates anymore, I’ve completely dumped Amazon products from both a buying and promoting perspective and am replacing those products with other vendors. But, something else has crept back into my life. And, I’m not quite sure what to call it yet. It’s sort of network marketing, but not exactly. It’s got lots of pieces of affiliate marketing, but it’s more than that. So, less than true network marketing but more than affiliate marketing. Just brainstorming this as I write, but it has a viral element to it, but without the pressure of in-home meetings commonly found when people are selling soap or vitamin drinks. Maybe, there’s a new word to emerge for it, like ViralTeaming or something. Mann, I just can’t put my finger on it. Here’s the situation….See if you can help me define this new phrase. We all just hate that whole industry! Tell me if there are more benefits to traditional network marketing, ’cause I just don’t see it…. Most affiliate offers are Tier 1, which means you only get paid commission on sales that start from your referral. If that referral refers to someone else, you don’t get commission. Affiliate programs by law cannot exceed 2-Tier, which prevents you from getting any further money than those two levels. Little or no support from the product owner. “Most” affiliate programs I’ve worked with give you little to no support. You might get some banners to display on your website, but that’s about it. The sales and lead tracking systems in affiliate marketing are produced by Internet marketers instead of what programmers would want to create. Lots of testing goes into the sales process and checkout process so that by the time you are promoting the site as an affiliate marketer, the content converts the most possible prospects. So, what’s my point? What’s so NEW about today’s affiliate/network marketing offers? I’ve come across two over the past couple of weeks. Today, I’ll use the example of one of them to see if I can show you how the industry is changing. My example is a company in the food industry that has a sort of club membership where you get $200 worth of groceries plus $300 commission for every six people you bring into the club. There is a one-time, up-front cost of $200 for you to join (plus a once per year payment of $10 to get the company website in your name so you can be tracked for your referrals), but you can spend that entire $200 shopping for groceries! So, you don’t lose anything out of pocket (more like an affiliate program). NO RISK! At the same time, you don’t personally have to convince all 6 people to join. You just focus on “2″ new members. When those two members get two others enrolled, YOU get a commission check for $300 and a voucher for $200 more in groceries. And, you can use that voucher at any WalMart or Sams club. You’re already going to spend money on groceries this month right? Well, unless maybe you’re a naturist living off your own garden! So, why not buy your groceries at WalMart? At least the ones you prefer to get at WalMart and then use your commission check to go to King Soopers or Safeway or whatever other place you want to get the other stuff. The company calls this a “cycle” where you have enrolled your team of six. Once that happens, you start another cycle and go find two more people to enroll. I was told yesterday (July 22) of a member who had “cycled” 12 times. That means he’s received a total of $2400 in gift cards toward groceries at WalMart and a check for $3600 in commissions to use anywhere. Oh, and by the way, he just entered as a new member in June! Oh, and remember the two people you brought in originally? As their two new members find two new members, THEY will get their $300 commission and $200 grocery voucher too! It’s entirely possible that you could pay $200 once and NEVER have to pay out of pocket again for your groceries! This is the network marketing part of it, but not really…and yet all at the same time. Why? Because the program goes beyond 2-tier but yet does NOT carry with it monthly fees like the typical auto-ship program. You just go find more people to “share what you’ve discovered!” So it’s really more like an affiliate program like I described earlier. Confusing! But, do you see the “viral” component here and why I’m confused what to call it? I mean, once you find something that has no risk because you get to CHOOSE what you want to buy with what you’ve already spent on the initiation fee, and you get to spend the money at a place that practically everyone shops at anyway (WalMart), and there’s the potential of never having to spend another dime on groceries, and you get such huge payouts of money (paid daily and weekly into your bank account), doesn’t that sound like something you would just want to blog about and write articles about and tell everyone you know–clients, prospects, family friends alike? By now, you’re probably wanting to know what this product is, right? Exactly! And, I want to tell you! Not because I’ll get rich off you (even though I might, ha), but because it’s a really good program that has come along in a crappy economy. And, just as I’ve heard about it, I’m doing my part to take it viral. But, yet, I’m recommending it to you to check out like I would any affiliate program. See my struggle? I just don’t know what to call something that includes all the positive components of affiliate marketing AND network marketing while avoiding the negatives of both at the same time, PLUS the no-risk element and throw in the desire to take it viral to the point where I want to tell everyone about it! Maybe VirWork or WorldNet Referring or something like that. I don’t know. I’ll think of a term for it eventually that combines the two. But, whatever you want to call it, there is definitely a new evolution happening where affiliate programs are using network marketing aspects and network marketing offers coming out are doing away with old-school network marketing practices and adapting their systems to what DOES work with affiliate marketing. Whew! What a mouthful! Go watch the video to see how this program works and if you do sign-up through my website, you will be added to my Go Cash Flow group where I will personally help you get started by phone and email to get your first cycle within one week. That’s like me personally handing you $500 on a silver platter! And, it doesn’t matter where you are in the country. While you’re watching, think of how YOU can apply this program to your own life and business. Maybe your church or charity is floundering with lower contributions and has run out of ideas for generating funding. Maybe you know of a child with a disabling disease and the family could use some community charity to help them through a tough time. Maybe you’ve been out of work for the past year and the creditors are calling you daily and you don’t know where your next bottle of milk is going to come from. I think we all know the answer to that, right?! Maybe you can help your clients fund their own use of your professional services by giving them a discount or credits based on the number of cycles they complete per month or quarter. Who knows? The possibilities are endless. The vehicle has just now arrived. Be creative! And, if you happen to come up with a word or phrase to call this new evolution of commissions-based selling, let me know in comments. If nothing else, realize that traditions are changing. People are changing. Offers are changing. How does your business need to change? That’s another topic for Website Waves coming soon! Here’s Joel Comm presenting at AffCon 2010 in Denver doing a great job of introducing the group to iPhone apps and being more of a Babe Ruth kind of Internet marketer….either go big or go home as the saying applies. I originally saw Joel Comm speak at Big Seminar a couple of years ago. He’s the author of Twitter Power and The AdSense Code. So far, he has a pretty softball speaking gig going on here showing a bunch of pre-made videos about what he’s done. Hopefully we’ll get to some actual to-do’s but that doesn’t really matter. Joel Comm is the keynoter. Joel is the one to kick things off. Joel is the one that AffCon really needed last year to kick off the conference. Ah! There we go…Joel is starting to talk about Mobile Marketing; a hot topic. 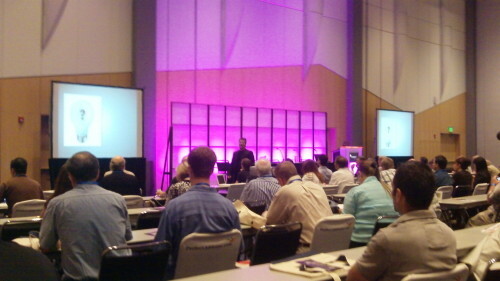 If you’re in any kind of marketing, you should be at AffCon 2010 in Denver, Colorado. Still two more days to go! You could be here today or even tomorrow. Join us! I’m on a panel at 12:45 talking about the challenges of blog platforms. It’s called the Blog Builders. Hope to see you here! In my family of full-time Internet marketers, there seems to be a hot trend to make as many websites as we can and build traffic from those sites in order to feed our main sites. But, how exactly does one manage the “feeding” part? About a year ago, I looked at a free product called OpenX. Last week I heard about it again and all day today I’ve been playing around with getting it installed. Essentially I can create an image add (or video or text among others) and then have that ad automatically display to any website I add the code to. I can have multiple ads rotating out on hundreds or even thousands of websites…promoting my own products and services. 1. I had to install the software to my web hosting account. Visit OpenX.org to get the free download files or just contact your hosting company to see if it’s already installed on your server. 2. Watch the video on the OpenX.org website to get a quick tutorial and then setup your campaign and sites so that ads will display. 4. Add the code to your sidebar. OpenX made a free plug-in for WordPress so you can just download that and add it to your sidebar as a widget and you’re good to go! 5. Create more ads and add them to your OpenX campaign. You can have as many ads rotating as you’d like! 7. Take it all to the next level and open up your websites for others to post to and have them pay you for the traffic you’re bringing to them. I’ll get there…but, for right now, I’m just building these out on my other sites. Can Internet Taxation Kill the Internet? If you are an affiliate marketer who lives in Rhode Island, and want to promote a book or other Amazon product on your website for commission, forget it. Amazon will not let you become an affiliate to sell their wares. Why? Because Rhode Island taxes the Internet. This is the look of things to come I’m afraid. Tax the web and watch companies stop selling things online. It’s just too much of a management load to account for taxes on every possible transaction and companies are not going to stand for it. Unfortunately, as this taxation disease spreads, people will finally take a stand shouting “What are you doing to us! !” And, there will be some big movement then to reverse the process. But, laws are much easier to prevent than they are reversing. And, there is no one in Washington to really stop this from happening. I came across this video from Rob McNealy who is campaigning on a local level for office. He has a huge presence on Twitter and has used the Internet for years to earn his living. You would be wise to support his effort financially or otherwise. We need someone representing us in Washington and here’s your chance to help get him there. Using the Internet to grow your business has dramatically changed since the beginning of 2009. If you’ve been misled into thinking all it takes to be successful online today is getting a few hundred followers on Twitter, spending hours a day “Facebooking” or gaining top placement on Google for your book title or business name, we’d like to offer you a reality check…and a path for hope…for the new year! Throughout 2010 I will be offering a new workshop called, fittingly, “Profit Again in 2010. If you’re not familiar with me, I’m a 15-year Internet marketing “lifer,” co-authored of “Web Marketing All-in-One for Dummies” (Wiley 2009), and I’ll be using this workshop to update you on the radical progression of WordPress websites, blogs, traffic building, social networking, rss, podcasting, Federal Trade Commission restrictions and Google banning since just a year ago. I don’t just “write and speak” about Internet marketing. I create and promotes my own products, manuals, and membership sites, with more than 100 of my own websites. Myself, along with a team of 7 at HereNextYear, Inc. have serviced more than 300+ clients nationwide. For just one of those clients this past August, we launched just one website that enjoyed 99 product pages indexed on top of Google within 3 days. By the end of the first week, the site brought in more than $3,826 in sales. By Thanksgiving, the site delivered its first $100,000 in revenue. Coincidence? No way. It’s the same process for any business, author or speaker…every time. All you have to do is find where you are in the process and plug in. True success of any financial measure for your book, product or business will be no accident or stroke of luck. And, in today’s economy, you can’t afford to shoot darts at a wall in the dark! You won’t find overnight riches or make that elusive “money while you sleep” with a casual, ho-hum approach. And it won’t happen by changing a few meta tags on your home page. That’s right, just three simple steps. First, you must identify where you are in the Internet marketing process and “plug-in” to that process. The success plan online is almost exactly the same for every business, author or speaker and hasn’t changed in almost 15 years! All you have to do is discover the process, find out where you are in that process and plug-in. Second, team-up with those that can help you implement the process. Hiring a random website designer from Craigslist or someone from a foreign country just because you can get services for 20 cents on the dollar might have helped five years ago, but outsourcing today only helps you if you are an experienced Internet marketing project manager. You need to start now to form a devoted team that will be at your side for years to come to help you with technical challenges and smart and calculated marketing planning. Third, only after you know the process and have a team to rely on can you expect to accelerate implementation and see the rewards. -Why Google has banned more than 150,000 websites for life in just the past month…and how to avoid being next! -The FTC’s crackdown on misuse of testimonials and affiliate marketing and what you need to do to protect yourself from being accused of false claims…The CAN SPAM Act was only the beginning to this! -Why every business owner, author and speaker should have “5″ websites or more…even if your competition already does! -The secrets of social networking automation that only those with 2,000 Twitter followers or more even know about. -The Article Marketing Underground Triangle: How to write an article once and use what you’ve written for explosive reach to more than 30,000 websites, video directories and bookmarking sites for obscene traffic flooding whenever you want it. -Plus, I will reveal my most closely held secret to managing what should be 10 hours a day of promotion productivity that gets accomplished in less than 60 minutes…every day. As we roll out this essential program, look for specific dates and locations to be accessible through our main website at HereNextYear.com on our Workshops page. 1. Know What’s Selling Online – If nobody’s buying it and nobody’s made it yet, that most likely does not mean “opportunity” for you. So, don’t get fooled. If you want to know what people are spending their money on right now, today, one great way is to go to Amazon.com and search a category of interest. The results you get will be sorted showcasing the best selling products in that category. 2. Enjoy Being Online – If you don’t like candy, you’ll be miserable in a candy store. So, before you go putting time and effort into learning how to make money on the Internet, you must learn to enjoy sitting at a computer and typing things. Of course, I could also add-in there using your mobile device. Social media is a great way to learn to enjoy working online. Join Linkedin, join some groups and participate in some discussions. Create a Facebook profile and reconnect with friends. Start tweeting on Twitter and inspire people to “follow” you because the quality of your tweets are actually worth paying attention to. User your personal name for all of your profile account names such as Twitter.com/MartyDickinson so that people can easily find you in the future. 3. Engage Offline Networking – An online business is a lot like a traditional off-line business in that financial success in both requires “people” to buy from you eventually. Go to Meetup.com and search for a group that meets near you to discuss certain topics. I just launched a few days ago, a Meetup group of my own called “Ski With Marty,” for example. Business owners, authors, speakers, and anyone else who wants to network and get some exercise can hook up with me every Wednesday during ski season at one of our world class ski resorts here in Colorado. By the time we have our first networking event on December 2, my goal is to have 100 members in the group. Checkout Meetup.com/SkiWithMartyInColorado if you’d like to see a sample Meetup group page. 4. Love to Sell – To be successful in any business, you must adopt a deep-down belief that anything you choose to promote is not really “selling,” but more of a “recommendation” of something you’ve experienced to make other peoples’ lives better. The fastest and cheapest way to do that is to find other peoples’ products to sell, try them for yourself, and start recommending them to others. These are known as “Affiliate Products.” ClickBank.com is my favorite for finding digital, downloadable affiliate products to sell and you can often contact the product producer and request a “review copy” of their product, which is FREE of course. Their hope is that by you having the product in-hand, you will have a better understanding of the product and will give more accurate recommendations. Continuing with my example of Amazon in step 1, they of course have an affiliate program as well. But, they only pay 4% of the sale price. So, the only products worth promoting on Amazon, in my opinion, are larger ticket items (over $75). 5. Register Domain Names – Whenever I am asked “Where do I register a domain name,” I steer them to BestDomainPlace.com. That is a domain name that I registered to point to my affiliate account. When you register a domain name for promoting an affiliate product, use the URL Forwarding feature (free with BestDomainPlace.com) where a tutorial is provided. Promote your affiliate products in your social networks and whenever a related subject comes up at your in-person networking events. Last week I was talking with a parent at my kid’s school about Internet stuff and suggested she buy a domain name for her personal name at BestDomainPlace.com. Sure enough a few days later, I saw the order come in. 6. Offer Your Services – Everyone has something of value they can offer. What is the one thing that you are truly really, really good at? Connect with others on your social networks (because you enjoy doing that by this step) who are in a related area to the service you want to provide. For example, one of the services I offer is creating websites for business owners, authors and speakers. So, I went to my Linkedin profile, logged in, clicked on “Groups,” and search for “authors” then joined a group, “professional speakers” and joined a group, and then “small business” and joined a third group. Within about 60 seconds, I was connected with over 16,000 people around the country who were in my direct target audience for a service I offer. Now all I have to do is participate in the groups and offer valuable content and the contacts begin. 7. Produce a Product – If you have an idea for a product, someone else has surely produced something close. At a recent Affiliate Marketing Meetup session, a good friend and former client who went off on his own to make $40,000 a month selling affiliate products online said, “Start off small by creating your own e-book, but first buy a few of the top selling e-books for that topic and use the best parts of each to create your product.” Now, he wasn’t suggesting you just copy and paste other peoples’ books into you own. But you can use concepts of how items are presented and rewrite them with different words and different examples. And, of course, add-in your own best stuff to make the product truly unique and the best on the market. If it’s a digital, downloadable product, get it added to ClickBank.com so that other affiliate marketers will have the opportunity to sell it for you. All of these steps and I haven’t even talked about “Starting a Website” yet. That just goes to show that there is so much you can do to get started on the Internet these days, in your spare time, on a shoestring budget. Then, when you earn a few bucks, use that income to broaden your reach…and that’s when a website, or 5, 10, 50 websites come into play. The best time in the world to get started on the Internet is right now, today.